As Duchess of Aquitaine, Eleanor grew up knowing what it was to be regarded for herself and not for her husband’s title. Now, as wife to Louis VII and Queen of France, she has found herself unsatisfied with reflected glory—and feeling constantly under threat, even though she outranks every woman in Paris. 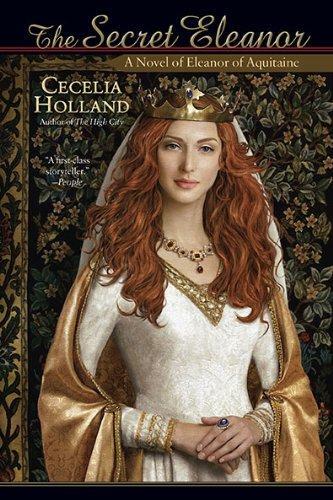 Cecelia Holland is widely acknowledged as one of the finest historical novelists of our time. She is the author of more than thirty novels, including The Angel and the Sword and The Kings in Winter. Holland lives in Humboldt County, in northern California, where she teaches creative writing, and is current at work on a new historical novel. Early in the novel, Eleanor doesn’t pray at church about her complicated situation with Henry because “God was a man, anyway, and would not understand” (p 46 in ms). In the context of the book, Eleanor seemed to defy this mentality and behaved contrary to the typical male-centric way of thinking in the 12th century. Discuss whether or not Eleanor would have spoken this same phrase by the end of the book. Although Eleanor lived a life of luxury and power, she seemed to want more freedom and less complication, as when she first acted as Petronilla, riding her mare and “in her heart she laughed and danced for her freedom like a bacchant” (p 56 in ms). Do you think Eleanor did ever yearn for a simpler life, especially later on in the course of the novel? Do you think most women in the 12th century desired more opportunity and freedom to choose their own lives? When Eleanor and Louis are discussing her lack of bearing a son, Eleanor states “I know this is God’s judgment. I will never come to you again as a wife.” Do you think this is simply an easy excuse to get out of her marriage, or does she really believe this? Do you think Eleanor was a dishonest woman? Discuss why or why not. Would any woman of her stature during this time period have acted similarly, or was it her idiosyncratic personality? Eleanor’s ladies-in-waiting are involved in every aspect of her life. Do you think this bond helped or hurt women during this time? Do you think women of lesser stature had similar bonds with other women? Cite examples when social standing is ignored and real friendship is shown amongst the women. When Henry’s father dies suddenly, the three remaining sons battle each other for his throne. Discuss the lack of loyalty among these brothers, and how it affected the shifts of power during the Middle Ages. At one point, Eleanor claims Henry “had what was better than love; as he had proven again now he had the gift of power” (p 212 in ms). Is this really what’s most important to her in regards to him? Did your opinion shift by the end of the book? Claire disbelieved Petronilla after meeting Thomas the Luter for the first time, when Petronilla tells her men only care about one thing. Why do you think Claire doesn’t believe her at first? Was Claire right to resist him initially? When Petronilla finally takes over as the Queen on their progress, it’s enlightening to her. Discuss how the opportunity to “play Queen” changed Petronilla for better or worse. Petronilla grapples with the “sin of lying” but Eleanor seems to have no qualm in this respect. Do you think it’s because Eleanor is trying to get ahead in a man’s world? Petronilla also believes that the intention to help her sister was no sin, even if the deed itself was. Discuss whether or not you agree with her, and how this might pose a different problem in modern society. After Eleanor almost loses the baby, Petronilla says “It is a sign. God favors us,” but Eleanor retorts with “Whatever that means” (p 338 in ms). Discuss the sisters’ differing viewpoints at this moment and what it might mean for their faith and the future of Aquitaine. No one in a position of power is to be trusted in the book—they are all plotting one way or another. Cite examples in the book when jealousy gets the best of the characters, especially Henry, Eleanor, and Claire. Do you believe that Henry’s love was for Eleanor or the Crown, and vice versa? After Petronilla learns of Eleanor’s plot to kill her, she feels she has “no true home” (p 411 in ms). Discuss this within the context of the book—is home a castle, a family, a homeland? With shifting loyalties and borders, is this ever really possible?